With the warmer season ahead, getting into your car for nature hikes, road trips, music festivals and fun getaways are what you look forward to when you can drive. While the fun times are ahead, having other people in your car regularly will inevitably leave your car in need of a deep cleaning. Here are some of the best car cleaning tips! 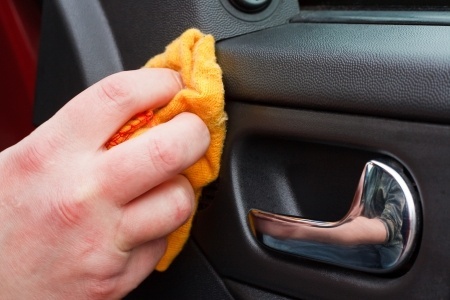 Car interiors can be sensitive to cleaning products. Avoid causing unnecessary wear and tear to your seats and vulnerable parts of the interior of your car. Make sure to do a quick search on the best products to use for your model. Your car manual can give you some insight on maintenance or a quick search on the internet never hurts. To effectively remove dust and debris, vacuum on a lower speed or toggle the power switch between on and off. This will ensure your vacuum doesn’t blow on full speed which causes the debris to spread everywhere. Instead, you can slowly collect the debris into a pile and remove it easily. By using a toothbrush and a paintbrush, you can effectively remove debris from crevices, corners and deeper locations. You can use the brush to aid in your vacuuming to clean up the more difficult spots. For gum, wax and other sticky materials you can use dry ice to freeze the material and gently scrape it off with a paint scraper to avoid damage to your car. Chewing gum remover also exists as an option but you’ll have to purchase it through an auto-detailing company or from a specialty cleaning supply store. Steering wheels, gear shift knobs, the sides of the door and seatbelts are subject to more grime build up than other parts of the car. Make sure they are all cleaned thoroughly and are in working condition. There have been cases where garbage has gotten stuck under the accelerator or brake pedal, or items like groceries that were forgotten about have rolled out from underneath. This can lead to serious accidents. By doing a daily check between your regular cleaning routine, you can avoid this. Check out our driving courses and get on the road!